we take up serving opportunities from the local church. I am a firm believer that God raises up people from the local church to serve and lead. A church leader’s job is to identify, equip, and empower those people to work together to further the proclamation of the Gospel. When we jump from church to church we take up valuable training and serving opportunities. we have little to no biblical accountability. One of the most important aspects of discipleship is being engaged in relationship within a church community. This is next to impossible when we serve in 5 communities. In a sense, no one gets to know the real us because we don’t spend enough time around any one group of people. Participating in the regular rhythm of life with other believers offers us the opportunity to grow spiritually, confess sins, speak/receive forgiveness, and serve together. 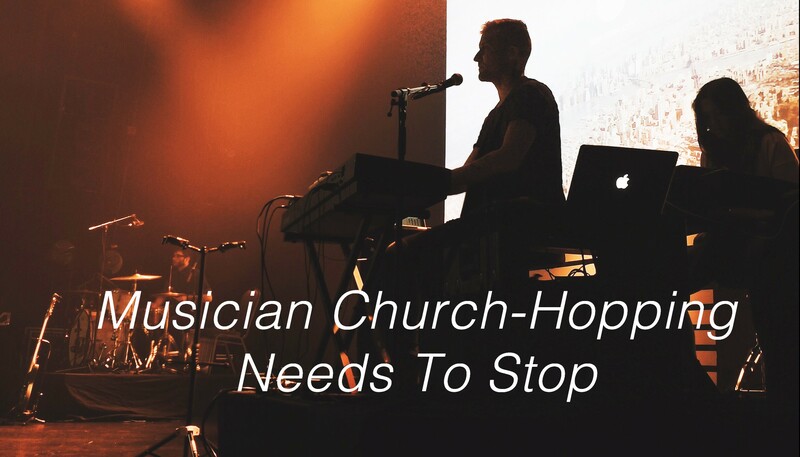 we hinder our worship leadership. When we show up to sing songs together, be filled by God’s word, experience Jesus through Communion, and pray together we are sending a powerful message to the rest of the church. We show them that we are part of the community and that we aren’t just there to play music on Sunday. Sometimes we worship on the stage and sometimes we worship from the seats. We are simply just musical members of the same body of Christ that they are. This enhances our leadership and effectiveness. So instead of jumping around, let’s let our roots grow deep into one community, getting to know the people we serve.